In the human body, a joint is a juncture where two or more bones come into contact. Joints can take on numerous forms, ranging from those fixed in place such as skull sutures, to those that provide a wide range of mobility like the hip, knee, and shoulder. The way bones in the joint are connected to one another also takes on a variety of forms, each determining the level of mobility associated with the joint. Fibrous joints permit no mobility, strictly connecting two adjoining bones. Amphiarthrosis joints such as vertebrae act as shock absorbers and are mostly made from cartilage. Finally, synovial joints permit a variety of movements. They are distinguished from other types of joints by their capsules that surround the articulating surfaces of the joint that contain synovial fluid. Hips, knees, and shoulders are all examples of synovial joints. Joint disease, or arthritis, occurs when the joint area becomes inflamed. Cartilage acts to protect the joint. It allows for smooth movement, and also acts as a shock absorber when pressure is placed on the joint, like when you walk. Arthritis occurs when the protective cartilage between the bones erodes. Without the usual amount of cartilage, the bones rub together, causing pain, swelling, and stiffness. In extreme circumstances, even the surfaces of the adjoining bones can erode away. There are a many types of arthritis, the most common being Osteoarthritis (OA), or degenerative arthritis. A variety of factors—hereditary, developmental, metabolic, and mechanical—influence the processes leading to loss of cartilage in OA patients. 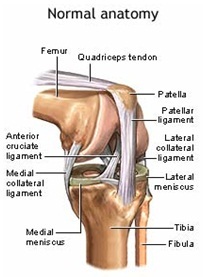 Ultimately the cartilage erodes because of wear and tear on the joint. Another common type of arthritis is called rheumatoid arthritis (RA), an autoimmune disease. The body's immune system normally fights off foreign substances, like viruses. But in an autoimmune disease, the immune system confuses healthy tissue for foreign substances. As a result, the body attacks itself. In the case of RA, the body attacks tissue in the joint. RA can occur at any age, and it affects women more often than men. 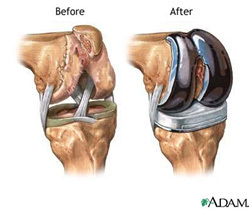 Why total joint replacement surgery? The effects of minor-moderate arthritis can often be mitigated by non-surgical means. Treatments include lifestyle changes such as weight loss, medications to reduce symptoms, and exercise and flexibility routines. In case of extreme arthritis, elective surgery is prescribed to allow patients to return to a normal lifestyle without pain. While surgical treatments can take on various forms, the most common and most successful treatment is a total-joint replacement. In a total-joint replacement, the diseased joint is replaced with an artificial joint. Surgical techniques and artificial joints have improved vastly over the past 20 years. Depending on both the surgeon’s preference and the patient’s diagnoses, the artificial joint may be made from metal, plastic, or ceramic materials. Minimally invasive techniques allow patients shorter hospital stays, and faster and more comfortable recoveries. For routine cases, the surgeries last under one hour. What used to be a five-seven day stay in the hospital has been reduced to three-four days. After the surgery, aggressive physical therapy is initiated immediately, and patients are often taking their first steps the same day of their surgery, if not the day after. developments. New blood conservation practices have allowed Operation Walk Syracuse surgeons to lower their blood transfusion rate from one unit per patient to 0.2 units per patient in the past five years. Whereas five years ago general anesthesia was predominant, now it is the exception rather than the rule. Regional blocs allow for far better post-op pain control. Additionally, other techniques including computer aided surgery and custom cutting blocks continue to push the field forward. The longevity of artificial joints is also constantly improving. If a patient receives a joint after age 60, experts are optimistic the joint will last the remainder of their lifespan. After a successful hip or knee replacement, patients often feel that their lives have been transformed. Before surgery, most patients struggle to walk without assistance. However after a successful recovery from surgery, patients can return to almost all the normal activities they enjoyed before the onset of joint disease. This includes walking, hiking, swimming, skiing, golf, and more. Patients are advised to stay away from impact activities such as jumping and running.